Explanation: Mercury, the closest planet to the Sun, remains the most mysterious of the Solar System's inner planets. Hiding in the Sun's glare it is a difficult target for Earth bound observers. 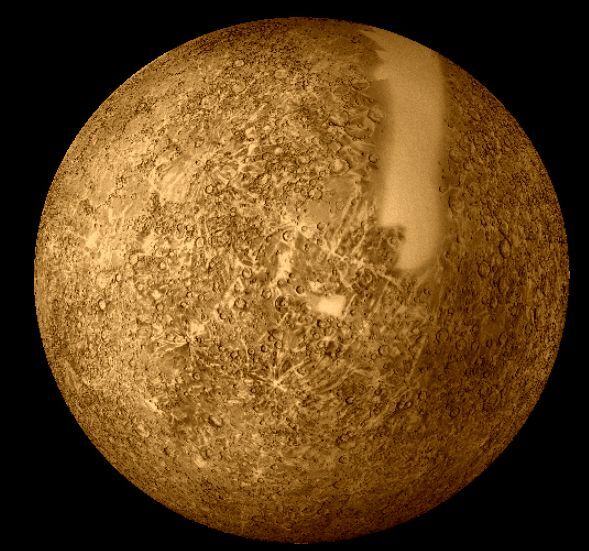 The only spacecraft to explore Mercury close-up was Mariner 10 which three executed flybys of Mercury in 1974 and 1975, surveying approximately 45 percent of its surface. Mariner 10 deftly manuevered to photograph part of the sunlit hemisphere during each approach, passed behind the planet, and continued to image the sun-facing side as the spacecraft receded. Its highest resolution photographs recorded features approximately a mile across. A reprocessing of the Mariner 10 data has resulted in this dramatic mosaic. Like the Earth's Moon, Mercury's surface shows the scars of impact cratering - the smooth vertical band and patches visible above represent regions where no image information is available.